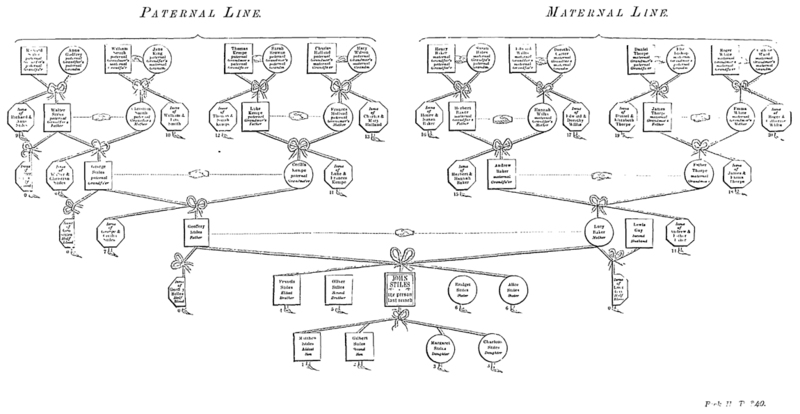 In William Blackstone's famous Commentaries on the Laws of England (1753), which were used to teach the law to many generations of British and American lawyers, there are two interesting illustrations. One shows a "table of consanguity" and the other a "table of descent". These were designed to help understand the complex ways in which ownership of land could be passed down from one generation to another (via the males). They can be found in Book 2 on "Rights to Things", Chapter XIV "Of Tiles by Descent". [A larger version of this image 246 KB JPG].